The baby board book Mommy Loves Baby presents an easy way of sharing a beautiful time with little ones. 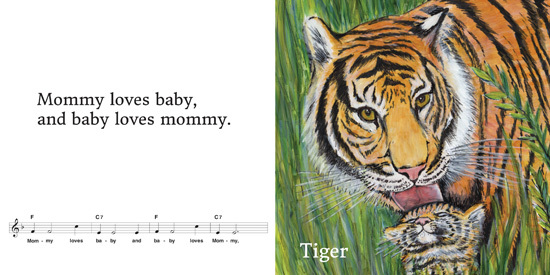 The author has created a lullaby that sets the mood to comfort and strengthen the bond. These simple, flowing words can be spoken or can be put to music on the page. With lively animal illustrations, this interactive opportunity engages adults and children together. This sturdy board book is easy for little hands to hold while flipping through the artful vibrant animal family pages. Andrea Dickkut, the talented illustrator has amazingly captured the animals showing love and affection in their natural habitat. Together the author and illustrator demonstrate how animals, like humans show affection toward one another. The addition of 9 black and white sketches and 9 finished colored pictures are displayed at the end of the book to build cognitive skills.